Primary Natural Resources asbestos, coal, clay, cassiterite. THIS TINY, LANDLOCKED, southern African monarchy is surrounded by the Republic of SOUTH AFRICA on three sides and MOZAMBIQUE on the east. Pine forests cover its western mountains, giving way to wide, rolling, central grasslands, then a low grassy plain, bounded by the high, narrow Lebombo Mountains on the east. Four main rivers flow eastward across the country—the Ingwavuma, Komati, Umbuluzi, and Great Usutu—supplying water needed to irrigate crops and to run hydroelectric power plants. According to Swazi legend, in the late 18th century, Chief Ngwane II led a small band of followers over the Lebombo Mountains, found other African peoples, made peace with them, and together became what today are the Swazi. British traders and Dutch settlers arrived in the 1830s and discovered gold, prompting a gold rush and negotiations in which the Swazi king and his advisers were pressured to sign documents granting the Europeans rights to mine minerals and to use the land for farming and grazing. The Swazi leaders could not read and did not realize that they were giving away their land and its riches. In 1894, Dutch settlers established the South African Boer Republic, which included Swaziland. However, in 1902, the British won the Boer War and took control until Swazi independence was granted on September 6, 1968. In 1973, King Sobhuza II ordered a new constitution written reflecting national traditions, including polygamy and the rule of the Ngwenyama or king as the country’s hereditary head of state, assisted by a council of ministers and a national legislature. The Ndlovukazi, mother of the king, is in charge of national rituals. If she cannot serve, one of the king’s wives is appointed Ndlovukazi. Sobhuza II died in 1982 after a reign of 61 years and was succeeded by his teenage son, Prince Makhosetive, who took the name King Mswati III. Swaziland has been popular tourist spot for South Africans for decades and has a number of lavish resorts. Wildlife abounds at Hlane Royal National Park in the eastern plains and five other national nature reserves. The official languages are English and Siswati. More than 80 percent of the population practices subsistence farming. 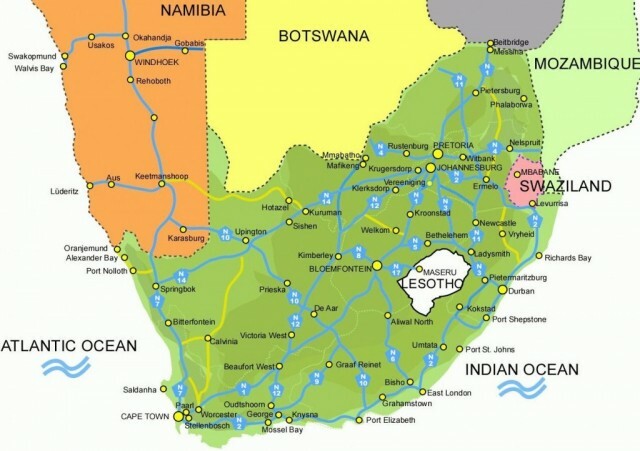 Swaziland has rich mineral deposits, large forests, and good farm and ranch land. However, most of the mines, processing plants, and profitable farms are owned by Europeans of South African origin. Sugar and wood pulp remain important foreign exchange earners. Overgrazing, soil depletion, drought and floods remain problems although large hydroelectric dams have been built on the major rivers. More than one-fourth of the population needed emergency food aid in 2002 because of drought, and more than onethird of the adult population was infected by HIV/AIDS. The predominant religion is Zionism (50 percent), a mix of Christianity and Swazi tradition.